Posted on 6, January 2016 by EuropaWire PR Editors | This entry was posted in Automotive, Investment, Italy and tagged Amedeo Felisa, Borsa Italiana, Ferrari, John Elkann, race, Raffaele Jerusalmi. Bookmark the permalink. MILAN, 6-1-2016 — /EuropaWire/ — “Ferrari: A new milestone, a new start”, these were the words Sergio Marchionne inscribed in the guest book of the Italian Stock Exchange during the Ferrari Listing Ceremony on the MTA. 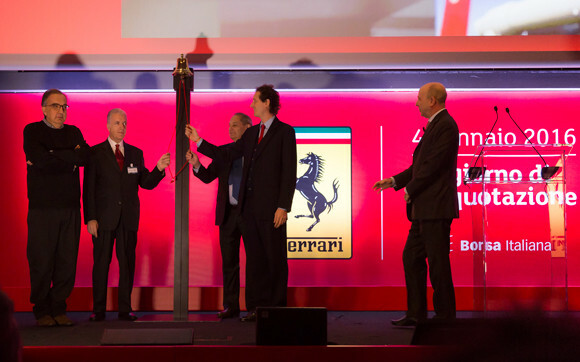 Raffaele Jerusalmi, CEO of Borsa Italiana (the Italian Stock Exchange) presided over the ceremony, which took place a few months following Ferrari’s debut on the New York Stock Exchange last October 21st, while Matteo Renzi, Prime Minister of Italy, was the guest of honour.